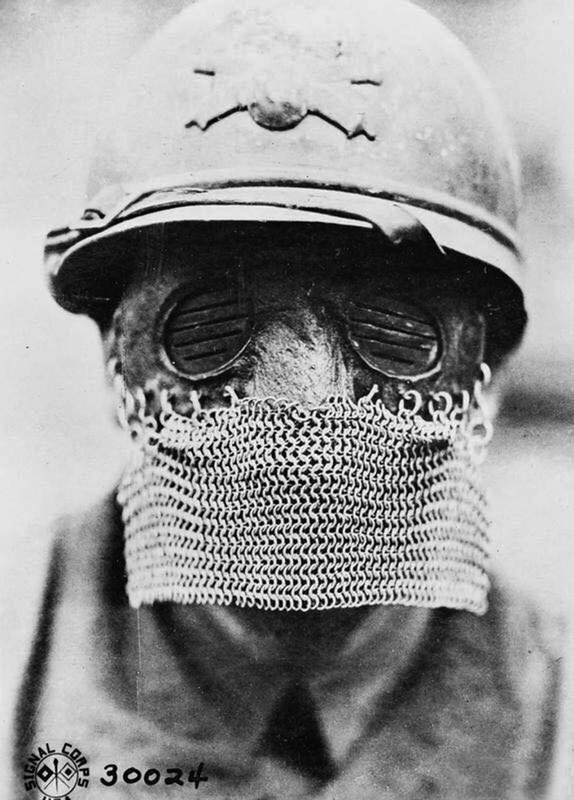 Splatter mask for tank crews, October 12, 1918. 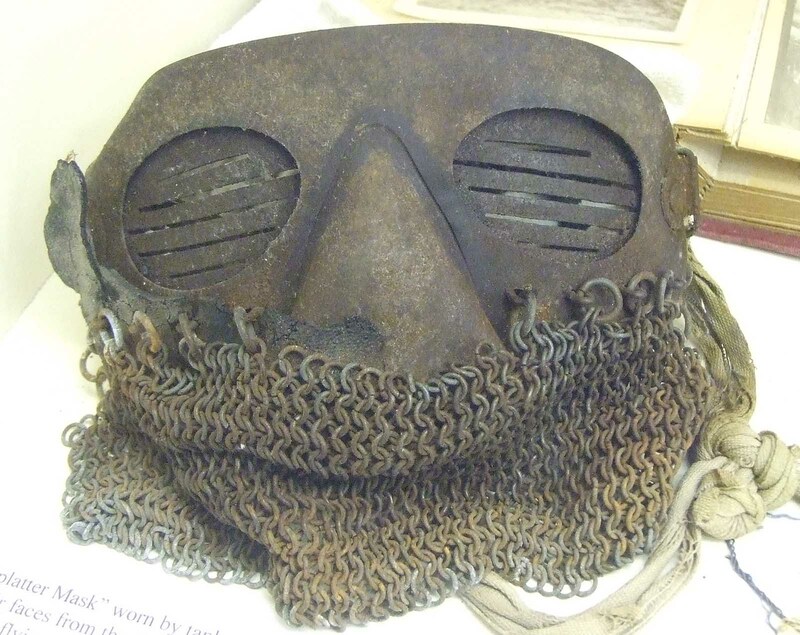 A British splatter mask worn by a French tank gunner, it was designed to help protect the crewmember’s face from shrapnel when looking through the view ports. The eye covers were metal, the mask was leather and there was a chainmail skirt to cover the mouth and chin. Various styles were worn by all sides. The helmet is a French Adrian helmet with artillery badge on front. The main reason of this mask’s existence was due to a terrible issue in the tanks during First World War called spalling. Basically, spalling occurs because the energy from the impacting round is transferred to the armor plate. This sends a shockwave through the armor plate, displacing the metal until the other side of the wall is reached by the shockwave. Since the armor plate can’t transfer the energy to anything else, fragments are ripped loose from the inside of the armor plate, and are slung into the fighting compartment at very high lethal velocity. The thicker the armor, the less likely it is for spalling to occur, and the British Mark I-V Tanks (these particular masks were worn by British Mark I-V tank crews) had very thin armor. The first tanks were mechanically unreliable. There were problems that caused considerable attrition rates during combat deployment and transit. The heavily shelled terrain was impassable to conventional vehicles, and only highly mobile tanks such as the Mark and FTs performed reasonably well. The Mark I’s rhomboid shape, caterpillar tracks, and 26 feet length meant that it could navigate obstacles, especially wide trenches that wheeled vehicles could not. A surviving splatter mask in a British museum.